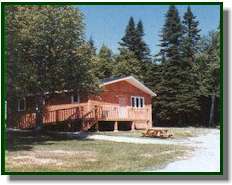 Lomond River Lodge operates during the months May through October. This is peak tourist season in Gros Morne National Park and it is important to book early to reserve your accommodations. Listed in the Table below are the rates for this coming season. (Note: on a weekly stay of seven days, the seventh day is free) These rates are peak season rates. All rates include two adults and there is a fee of $10.00 for each additional adult in the cottages and $3.00 for campsites.. No charge for dependant children. Peak season for cabins and motel units is June 23rd to September 7th.